The Portfolio Accounts can be used to track share investments in multiple currencies. In this section we will discuss how to add, edit and delete share transactions in your Portfolio Account. 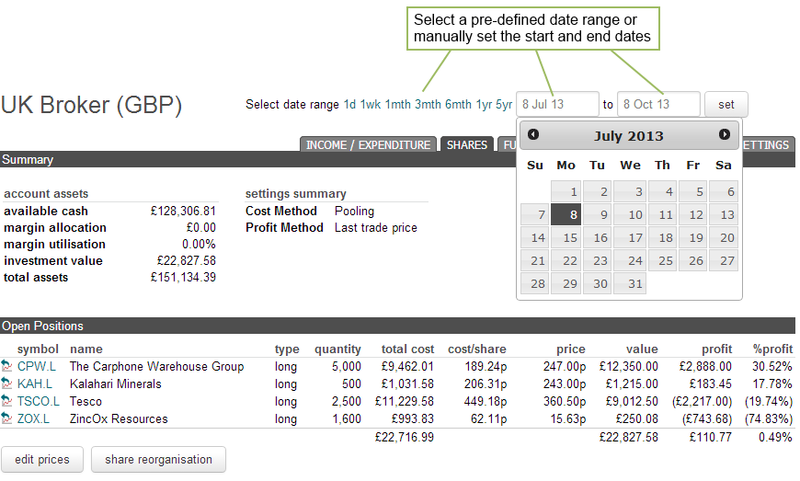 You can now enter the share transaction details in the fields as illustrated in the following screen shot example. Symbol: Enter the share symbol using the format recognised by timetotrade if automated price updates and historical valuations are required. If you are unsure of the symbol, start typing the company name into the 'symbol' text field. A drop down menu will appear displaying possible matches and their associated symbol. Note that timetotrade provides automatic portfolio price updates for various exchanges, and so we use an international format to identify stocks. If timetotrade does not provide price data for the share, then use a unique symbol for all related share transactions to enable matching buy and sell orders. London Stock Exchange: shares must be entered in their international format by adding .L to the EPIC for example Barclays is entered BARC.L or Vodafone is entered VOD.L. If you would like your portfolio to be updated with Real Time prices from the BATS Exchange then use the X: prefix. For example, Barclays would be entered as X:BARC.L or Vodafone X:VOD.L. Asset Type: Typically the asset value should be set to 'not applicable'. Set the asset type to "business" or "non-business" assets if so required for the completion of legacy UK Tax Returns. For any transactions that occurred between the 6th April 1998 and the 5th of April 2008 (inclusive) two levels of Taper Relief were available depending on whether the shares purchased were classed as "business" or "non-business" assets. The level of Taper Relief depended on the number of years you owned your investment and the classification of the investment. The 'asset type' field is used to define if the investment is classified as a Business or Non-Business asset. Typically shares traded on the main London Stock Exchange are classified as Listed / Non-Business assets, however shares traded on the Alternative Investment Market (AIM) are typically (but not always) classified as Non-Listed / Business assets. Please consult with your Stock Broker or the Investor Relations department of the company you have invested in if you are not sure as to whether or not the investment is to be classified as a Non-Listed / Business or Listed / Non-Business asset. Quantity: Input the number of shares purchased / sold. The system supports fractional shareholdings. Price: Input the purchase or sale price of the share. Please note that the price associated with a UK share and dividend transactions should be entered in pence (GBX); commissions and tax should be entered in pounds (GBP). For US Dollar and Euro transactions all fields should be entered in Dollars and Euro respectively. Tax: Input the stamp duty payable on purchase or other regional taxes applied. For UK share transactions, the tax should be entered in pounds (GBP). Total: This field can be left blank if the quantity, price, commission and tax fields have values; in this case the total transaction value will be calculated. Alternatively the value can be overwritten. 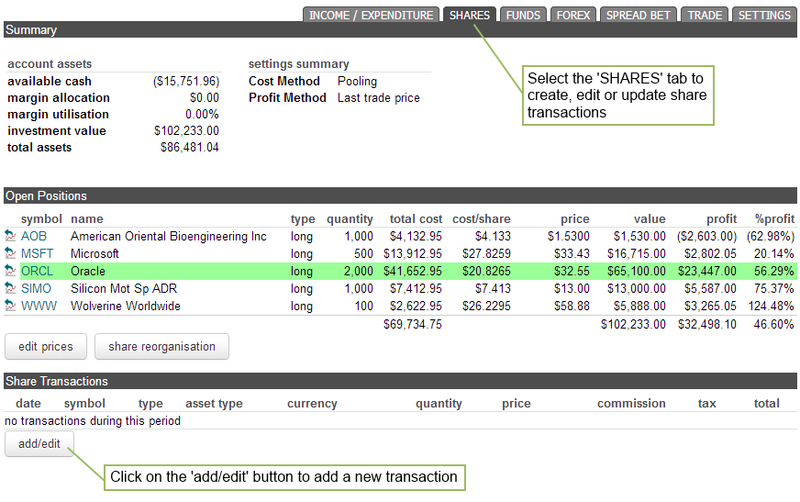 Once you have finished adding your share transactions to the account, click on the "done" button as illustrated above.